Aboriginal Student Leadership groups around the district collaborated to choose the theme Seeking Wisdom. 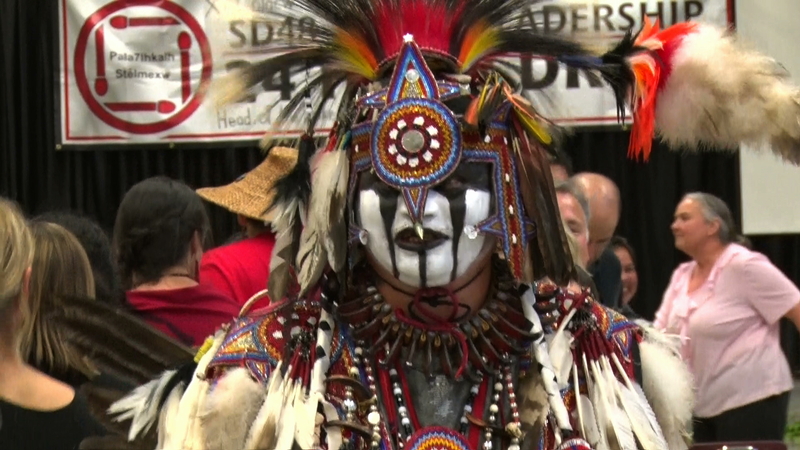 The 24 Hour Drum is organized every year by aboriginal groups around B.C. 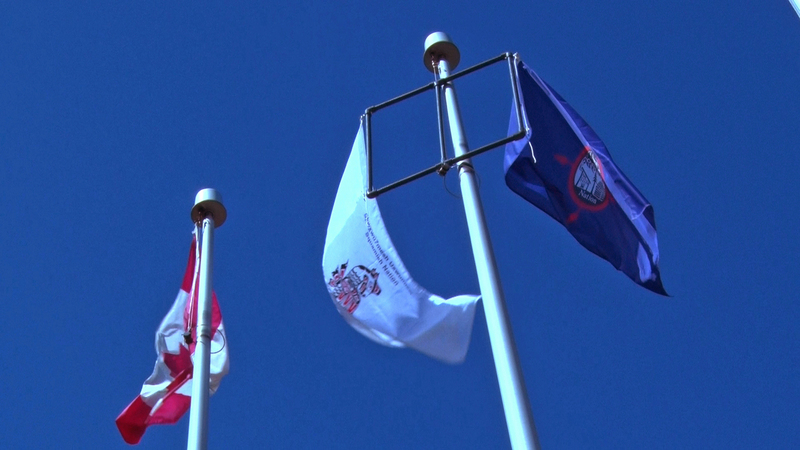 It was started as a way to shed light on issues affecting aboriginal people. Every year, these groups come together and pick a focal point on what they wish to change or improve. My name is Lexlixatkwa7, and it is OK if you are not sure how to pronounce it; most people call me by my Canadian name, Maya. I am currently a high school student at Pemberton Secondary School, and will be graduating next year. At first glance, I would not appear to be of First Nation decent — and that is due to the colour of my hair, a copper red, my green eyes and my light complexion — but I am. School District No. 48’s Aboriginal Leadership group hosts a 24 Hour Drum event. Our group is comprised of 80 students from across the Sea to Sky corridor, including Pemberton Secondary, Whistler Secondary, Howe Sound Secondary, Learning Expeditions and Don Ross Middle School, as well as students from Xet’olacw Community School. Our work this year focused on Seeking Wisdom from our Elders in all the Sea to Sky communities. We developed guiding questions regarding issues in environmental preservation, language revitalization and reconciliation and met with our elders, seeking their wisdom. Their teachings shaped our work for the 24 Hour Drum event. After months of planning, the day of the event, April 21, was upon us. 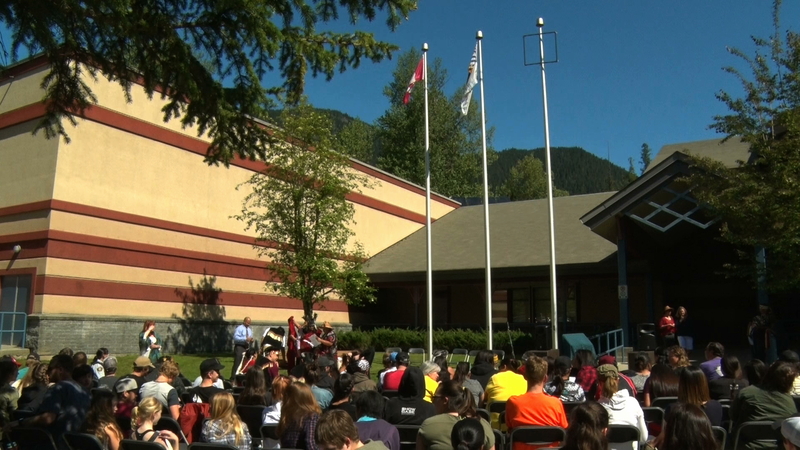 Students from across the Sea to Sky corridor travelled to Stawamus School in Squamish. When we first got to the school, a cameraman took pictures. As I stood in the gymnasium with my group, nervous, as this was my first time being there, I noticed the drummers in the corner keeping the drum alive. First rehearsal was a bit rough, but it felt better after we rehearsed in the gym. Once everyone arrived, we made a circle outside, and the Squ7umesh nation welcomed us into their territory. We did our best to follow protocol, and it was after the welcoming that we started our performances for the school. Everyone was open and respectful without judgment. All the while, the people in the corner were still drumming, and keeping the rhythm going. After our performances, students carried the drum across the bridge to Totem Hall, where we continued to share our learning by honouring the elders who shared their stories with us and hosting a dinner for all members of the community. At this time, there was a nearly tangible sense of pride in the air, as the youth proudly sang, drummed and laughed together. Later, I helped bring our belongings and props into Totem Hall, and then I saw my grandmother, auntie and my cousins. They encouraged me by saying how much they enjoyed our performance of Sulyalesta, an old women’s dance, and Swinya, the wild man’s dance. Everyone gathered to share a meal, which was when I started to feel a bit more relaxed. Drumming on the big drum was the highlight of my trip. I awkwardly led a few songs, and though I forgot some lines and tunes, we all laughed and had a good time. When we blanketed the elders we were careful to follow protocol. 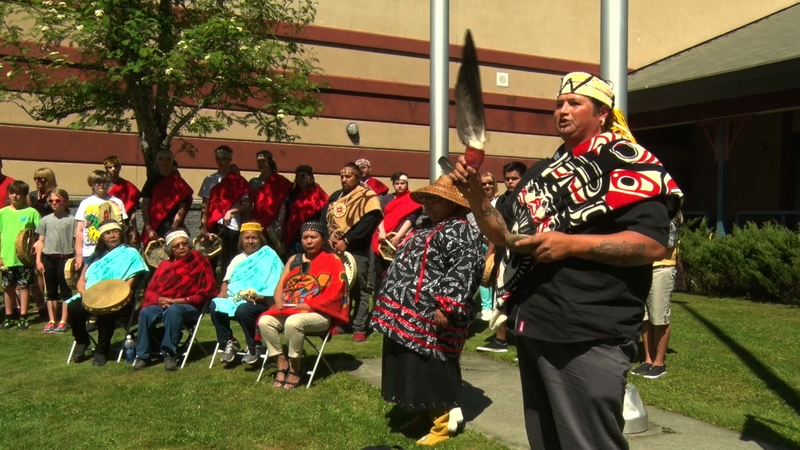 I was honoured to participate in honouring our elders. I helped carry the drum across the bridge back to the school, and everyone was taking shifts to keep the drum going; people had even fallen asleep on the hallway floor! In the morning after the drums beat for 24 hours, the beat stopped and we went home with a sense of pride and accomplishment. It felt good to be a part of something that brought my people together to practice our traditional customs. It felt good to remember. Maya Nelson is a Grade 11 student at Pemberton Secondary School. This year the 24 HOUR DRUM was held at Whistler Secondary on May 6th 2016! This event aimed to immerse communities in Aboriginal traditions while drawing attention to Aboriginal issues and raising funds to support Aboriginal initiatives. The students’ passion and commitment to Reconciliation is leading our learning in SD48! 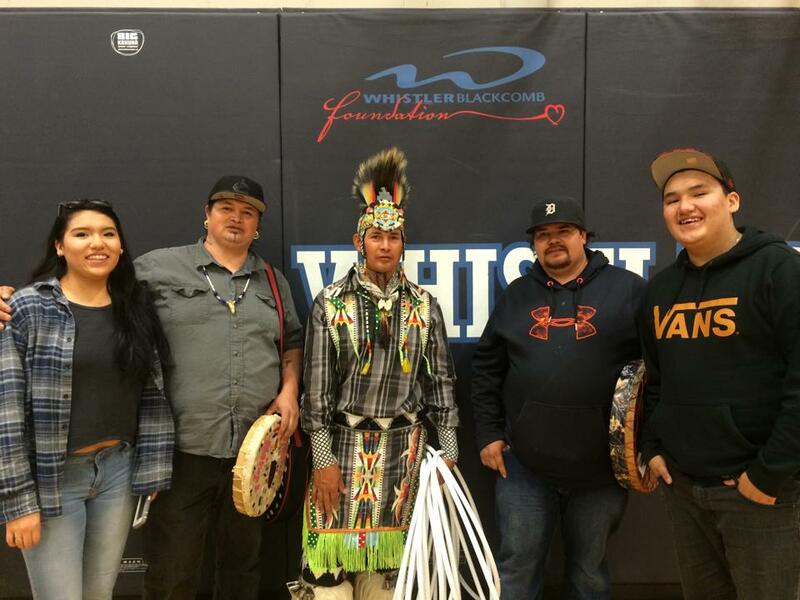 We shared our 24 Hour Drum vision with WSS on April 13th as the entire Aboriginal Leadership team presented to the staff and students at an assembly. The Wells brothers capped the event with drumming, singing and hoop dancing! LANGUAGE REVITALIZATION– learning from our Elders, a drum song or dance in their language and sharing their learning with other Nations. ENVIRONMENTAL IMPACTS ON OUR TERRITORIES- students are focusing on the impacts of energy consumption and extraction on land and communities in our country. 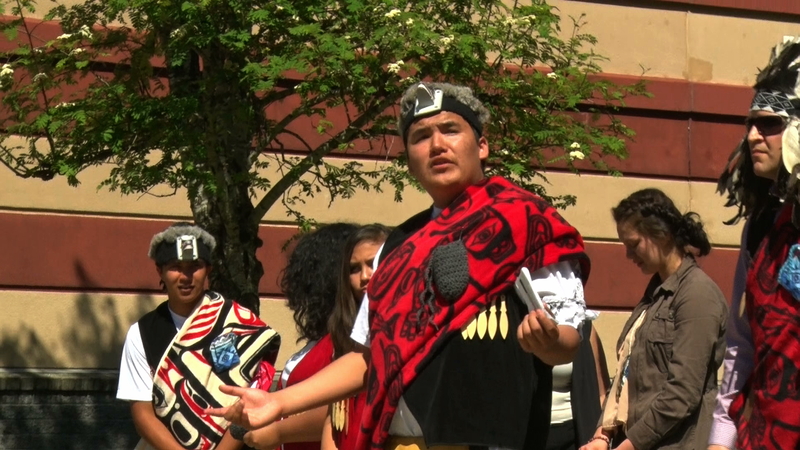 Skwxwú7mesh Nation and Howe Sound Aboriginal Leadership students, part of the 2016 24 Hour Drum leadership group, shared their learning about the environmental impacts of LNG on their Traditional Territory with the Lieutenant Governor Judith Guichon. For more information about the 24 Hour Drum, please contact the District Principal of Aboriginal Education, Susan Leslie, at sleslie@sd48.bc.ca.